Ever wondered what chefs love to cook when they are in their own kitchen? Away from the intensity and heat of restaurant service, what food makes them happiest on a weekend off? 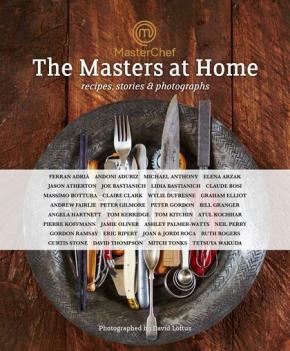 33 globally renowned chefs have each shared three recipes for their favourite weekend treats in this special MasterChef collection of food at home. The fascinating background of each chef is explored and accompanying candid snapshots from their home life provide a unique, never-seen-before window into their world. Such an intimate showcase of chefs' private cooking is artistically captured by the legendary photographer David Loftus. Chefs featured include: Ferran Adria, Andoni Aduriz, Michael Anthony, Elena Arzak, Jason Atherton, Joe Bastianich, Lidia Bastianich, Claude Bosi, Massimo Bottura, Claire Clark, Wylie Dufresne, Graham Elliot, Andrew Fairlie, Peter Gilmore, Peter Gordon, Bill Granger, Angela Hartnett, Tom Kerridge, Tom Kitchin, Atul Kochhar, Pierre Koffmann, Jamie Oliver, Ashley Palmer-Watts, Neil Perry, Gordon Ramsay, Eric Ripert, Joan and Jordi Roca, Ruth Rogers, Curtis Stone, David Thompson, Mitch Tonks and Tetsuya Wakuda.